2016 Stohs Prospect Handbook Profile: Jason Adam was the 5th round pick of the Kansas City Royals in 2010 out of high school in Overland Park, Kansas. In 2014, he entered the season as the team’s ninth-rated prospect according to Baseball America. 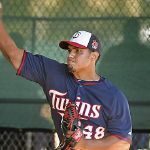 He pitched in AA and AAA with the Royals before an August trade sent him to the Twins in exchange for Josh Willingham. He made just two appearances for the Twins. When healthy, his fastball sits 90 to 92 mph, though if he sticks to the bullpen, he can top out at about 95. He also have average curveball and change up.